Iran hit back on Tuesday morning after an angry warning from President Trump. Mr. Trump said in a Sunday tweet that Iranian President Hasan Rouhani would "SUFFER CONSEQUENCES THE LIKES OF WHICH FEW THROUGHOUT HISTORY HAVE EVER SUFFERED BEFORE," if he threatens the United States. As CBS News correspondent Elizabeth Palmer reports, on Tuesday a spokesman for Iran's Foreign Ministry said there would be "equal countermeasures" if the U.S. pushes ahead with attempts to block Iranian oil exports. "If America wants to take a serious step in this direction it will definitely be met with a reaction and equal countermeasures from Iran," foreign ministry spokesman Bahram Qassemi said according to Iran's state-run news agency IRNA. 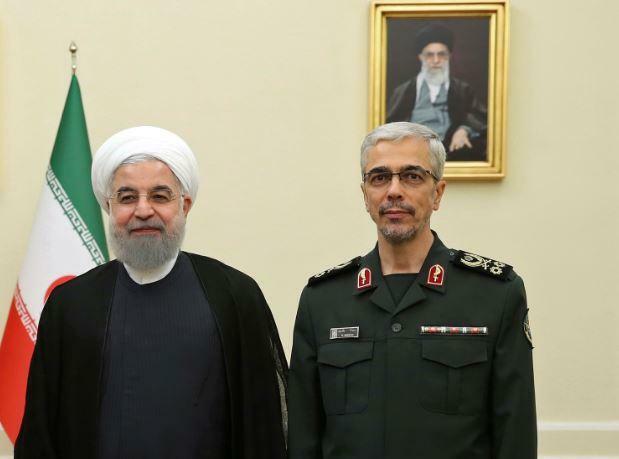 The same news agency quoted Armed Forces Chief of Staff Major General Mohammad Bagheri as saying U.S. threats would draw a "strong, unimaginable and regrettable" response from Iran, according to Reuters. Tensions have escalated enough since Sunday to draw a warning from the United Nations Security Council, the current leader of which told CBS News on Monday that the exchange of threats is the "opposite" of what is needed to maintain the delicate balance of peace in the region. Trump tweets warning to Iran: "BE CAUTIOUS"
Current Council president and Swedish Ambassador to the U.N. Olof Skoog told CBS News' Pamela Falk that, "any escalation, rhetorically or otherwise in that region is something that would be of concern." "The region needs the complete opposite, which is de-escalation and confidence building," Skoog said. The U.S. is pushing many countries hard to stop buying Iranian oil before U.S. sanctions are put back in place as part of the Trump administration's rejection of the Iran nuclear deal struck by President Barack Obama. The sanctions will make any foreign institutions that continue to do business with Iran subject to huge fines and possible blockage from the U.S. financial system. Many U.S. allies in Asia, the Middle East and elsewhere have been trying to negotiate exemptions to the looming rules, but as of last week, they didn't appear to be getting far. "One council member has moved away from the deal," Skoog said of the Trump administration's withdrawal from the 2015 agreement, "so of course that makes it difficult for the Council to express itself, but the great majority of Council members and certainly members of the United Nations are fully behind the deal that was struck." On Monday, Iranian Foreign Minister Mohammad Javad Zarif issued the first regime response to Mr. Trump's Twitter warning, saying in his own tweet: "COLOR US UNIMPRESSED: The world heard even harsher bluster a few months ago. And Iranians have heard them - albeit more civilized ones - for 40 yrs. We've been around for millennia & seen fall of empires, incl our own, which lasted more than the life of some countries. BE CAUTIOUS!" Asked on Monday whether he had concerns about provoking Iran, Mr. Trump said, "None at all."